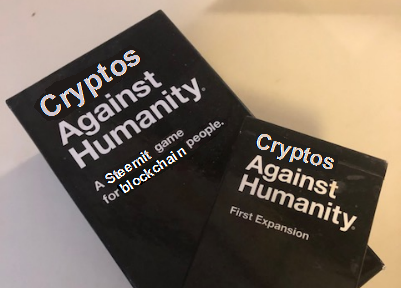 Definitely *Not* A Cards Against Humanity Contest - Week 12steemCreated with Sketch. Hello again, contestants! We made it through Week 11 despite the blood bath in the crypto market, and now we're back for Week 12! 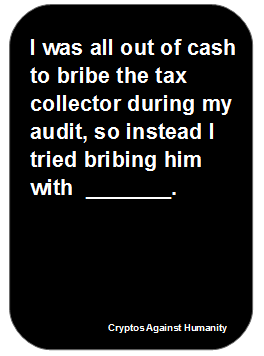 I was all out of cash to bribe the tax collector during my audit, so instead I tried bribing him with _______. The Encyclopedia of AFL Footballers. 7th ed. By @manoldonchev. Congratulations! I just had this mental image of you just searching frantically for something to give as a bribe and finding this sitting on your bookshelf collecting dust and grabbing it. Anyway. Winner. 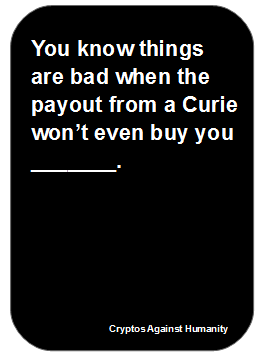 You know things are bad when the payout from a Curie won’t even buy you _______. I mean, how expensive could they be? Thanks for crowd favourite last time! tea, camphor, sugar, gold, coal, sulphur, economical plants, and other productions. Dollars, I think you might need to do your upvote payouts on days five or six instead of day seven. I remember coming across a post saying that votes on day seven don't count, but I couldn't find it. Looking at past contests, It looks like some contestants didn't get a payout. The best format is to stagger the upvotes over several days so that the upvote regenerates to 100%. Kwok Tak-seng OBE (March 12, 1911 – October 30, 1990) was a Hong Kong entrepreneur and the founder of Sun Hung Kai Properties, the largest property developer in Hong Kong. Yeah, that's a good idea, I should start doing it that way. I think it was a post by @dustsweeper that said they had problems with upvotes on the seventh day. They went to the 6th day, but now seem to upvote on day four. I tried looking through the FAQ page for the exact cutoff. SteemIt is not well documented. Of course, in this day of ever declining STEEM, it is hard to keep an upvote value over $0.027 ... which is what dusty says is needed to secure a payout. Your UA account score is currently 2.951 which ranks you at #10809 across all Steem accounts. In our last Algorithmic Curation Round, consisting of 249 contributions, your post is ranked at #128. Thank you! I am so happy my 7th ed. volume of this super rare encyclopedia has been appreciated.